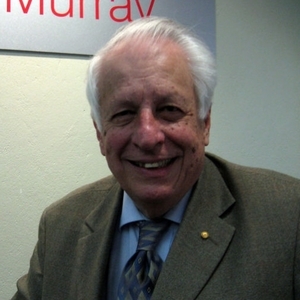 Sir Gustav Nossal arrived in Australia from Vienna when he was eight years old. He graduated from Sydney University’s Medical School with first class honours and gained his PhD degree in 1960. Sir Gustav is one of Australia’s most celebrated scientists. His research accomplishments are world-renowned, with his work confirming Burnet’s theory of antibody formation a watershed in understanding of the immune system. As researcher and director of The Walter and Eliza Hall Institute of Medical Research from 1965 to 96, he helped build the foundations of modern immunology and define the field for more than 30 years. Sir Gustav has been directly involved with the World Health Organization since 1967, most recently as chairman of the Global Programme for Vaccines and Immunization, and has helped shape the scientific affairs of Australia for decades. As president of the Australian Academy of Science he provided valuable input to government policy-making, and has been an influential public commentator on scientific and medical issues. His many lectures and radio and television appearances have inspired ongoing popular and political interest in science and its applications. Sir Gustav is chairman of the Strategic Advisory Council for the Bill and Melinda Gates Children’s Vaccine Program, which works to ensure children in developing countries are immunized. He is also deputy chairman of the Council for Aboriginal Reconciliation and deputy chairman of the Advisory Council of The Global Foundation. He is also heavily involved in charitable work and is patron of a number of organisations. The Nossal Institute for Global Health at the University of Melbourne and the Nossal High School at Monash University are named in his honour. He is a fellow of the Royal Society of London, a foreign associate of the US National Academy of Sciences and a member of the Académie des Sciences, France. It is truly a delight for me, it really is. Make sure that I get this right. I’m horrible at pronouncing any other name but my own. I want to make sure I hear yours right. I think you should just call me Gus. Everybody does. You don’t want to believe everything you read, you know, Chris. Well if it’s in the internet, it must be true, right? Let me tell your colleagues, all of us in the I Share Hope podcast just a little bit more about immunology and that will also segue into telling you a little bit more about myself. I have actually had two professional lives. They’re related, but they’re different. The first goes on for 40 years and that was me as a medical research worker in the field of immunology. What is immunology? Immunology, simply put, is a study of the natural defense system of the body that which you have within you, that keeps you free of disease, that allows vaccines to work and that also provides a certain bulwark against cancer. That natural immune system is based on cells that we call white cells of the blood and if you want to be a bit technical, they’re called lymphocytes. Would you believe that I spent 40 years of my misspent life studying those damn little white cells that are keeping you free of disease. I really appreciate that. It’s working. From the point of view of saying how does it work, why is it so, that which in the trade we call fundamental research. That is really the first and probably the most important part of my life. However, there is a second thread and I was extremely lucky to be in possession of the second thread when I came to my retirement 19 years ago. I therefore was no longer able to conduct the laboratory advanced research. That is related to the importance of immunology in public health. This comes with a little bit of a story, a little bit of a sad story attached to it. I guess as a person of hope, I’ve always had a bit of a bleeding heart and would you believe, since about 1964, I’ve been on a variety of World Health Organization committees trying to see how come this knowledge that I’ve accumulated benefit the people in the developing countries? They have enjoyed the same high standard of health that we do in the west and they definitely can benefit tremendously from some of the tools that medical research has provided particularly in the field of vaccines. So, this significant part time involvement in vaccines and advocacy for third world health in trying to boost up life expectancy in the third world was a minor thread while I was actually earning a salary. But, I had the good fortune of being able to make my night job my day job when I retired and really concentrated full time on global public health. Now there and then, fate took an entirely unexpected hand and if you want to talk about hope, this is about as hopeful a thing that could have happened to anyone. Would you believe that someone or another from the Bill and Melinda Gates foundation caught on to my name and said, oh here’s good old Gus. He’s been on this WHO gig for so long, why don’t we make him the chairman of the strategic advisory committee or council of the Bill and Melinda Gates children’s vaccine program? Now, the foundation is a quite amazing body. It’s been as close to $4 Billion a year for the welfare of humankind. Bill Gates ison record saying that this immunization project which I had the enormously good fortune of helping to bring into the world. I was one of the obstetricians for the project. It’s the most successful thing he has ever done. It’s the most successful program of the Gates Foundation. It’s got a technical name. It’s technical name is the GAVI Alliance. That simply means the Global Alliance for Vaccine and Immunization. That has brought vaccines to countless millions of people and saved countless lives.Isn’t that a little story that gives you hope? That really is. Well Sir Gus, thank you for letting me call you Gus. I’m I shouldn’t be, but I really appreciate your graciousness. That’s incredible, really incredible. So, you’ve been involved with the Gates Foundation for how long then? Well family enough. I was actually in its pre-history because this appointment started in 1997 and they made to launch the foundation, it wasn’t until year 2000, but I’ll tell you a funny little story. The very first announcement from the Bill and Melinda Gates Foundation which wasn’t really yet a properly constituted foundation, was that it would be giving $56 Million to the cause of global immunization and I got wind of this from my WHO standpoint and I said gosh that’s pretty good. 56 million is better than an kick in the pants and then the spin doctors got onto situation and they said to Bill Gates, “Bill Gates, you’re Bill Gates. You are the world’s richest man. You can’t announce this gift for immunization, this $56 Million. It’s got to be $100 Million”. I found myself in this incredible situation on the 2nd of December 1997 at the Waldorf Astoria Hotel in New York in front of, I kid you not, at least a hundred cameras, still cameras, television cameras with four people on the platform, Bill Gates, Melinda Gates,Carol Bellamy representing UNICEF and poor old Gus representing the World Health Organization. We all gave speeches and I will leave it to your listeners to decide who gave the best speech and I will also tell you that wasn’t the person who got reported in newspapers and the televisions the next day which you can also guess. Well, I’m glad we got to talk to you who probably gave the best speech that day. It was a totally amazing thing. We moved on from there and you will probably find it difficult to believe that by the time we got to the official launch of the Global Alliance of Vaccines and Immunizations at the World Economic Forum beginning in the year 2000 and the sum have gone up to $750 Million and increased very considerably since then. Of course, for something as important as global immunization, others had to come in and now it’s strongly supported by the aid agencies of the world and it’s approximately a $2 Billion a year program. Unbelievable, really. How many countries are you impacting right now? It was a decision taken quite early that we would take the 73 poorest countries of the world, those at that time with the GDP of less than $1000 per head of population for year. That threshold has since gone up to $1500, but it’s definitely targeted to the poor. Wonderful. I’m so thankful for you. Seriously, I know that that just doesn’t impact the poor families and individuals in the world, it has to trickle into even the more well-developed nations. Well, that’s right. You know, if you now move on from vaccines to other forms of therapy like for example, the Antiretroviral therapy for HIV AIDS, the programs have very much gone not just to the poor countries, but to the middle income countries. As we sit here today, less than 13 Billion people are benefiting from the extraordinary twin programs called the President’s Emergency Fund for AIDS Relief, that’s called PEPFAR, arguably the best thing that George W. Bush ever did. The other one called the Global Fund to fight HIV AIDS and tuberculosis. Between them, they are giving these Antiretrovirals to a very large number of people and so that AIDS is no longer a death sentence. It now a controllable disease. Wonderful. Well, you’re going to be great at answering these questions. Let me jump in here. Let’s hear what the answers are. Look, I’m going to be incredibly convinced on here and just use a common one and we hope springs eternal in the human breast. Why do I say that? Because all the things, programs that relate to improving the health and wellness of humankind are one of sorts of glass half empty, glass half full sorts of stories. I happen to be a glass half full person. I’ve always been a person that’s been an optimist, I’ve always been a person who has hope and let me give you one stunning, I think absolutely stunning fact about this. Let’s talk about a very sad subject, mainly death in childhood from disease. Beyond the early age of five, in 1960 when I was just a young doctor, there were 20 million deaths per year in the world in children under five. Today, there are 6 million and that is of course from a much larger pool because the world’s population has increased remarkably in those 50 years. Now, isn’t that an example of hope? Isn’t that an example of a glass half full? There’s a long business to go, there’s 6 million. That’s still far too many deaths. As a matter of fact, the rate of death of children under five in the developing countries is 13 times that in the rich industrialized countries. So of course, the glass is also half empty. But with hope, we can continue that trajectory and 2015 is the year of the emerging development goals. We’re going to have to start a whole new heap of goals. In this particular case, the goal is to have that number of deaths again in the next 15 years. Brilliant. That’s really great news and you know, that’s one thing. We really don’t hear that much about from the media. It’s how good we’re doing in changing things. That’s really encouraging to hear you say that. Well you’re absolutely right Chris. I mean the fact of the matter is the media likes sensationalistic stuff. The media one way or another tend to focus on bad news and here is what you can really call a global good news story. The pendant, to a large extent, on something that many people don’t understand is it’s depended on foreign aid. A lot of people think, oh foreign aid, that’s just a way of squandering money on dictators and third world countries. They squirrel their way into Swiss bank accounts.I’m not going to deny that a little bit of that may go, but overwhelmingly, that portion of aid were just spent in the health field and spent well and achieved these remarkable results. Question 2: Who has given you, in your life, the most hope? Yes. Well, since I saw your excellent outline, I’ve been giving it a little bit of thought and I’m going to speak to you about two mentors. Both of them were very different. Both of them have given me hope and both of them have had a profound influence in my life. We’ll start with my boss in the basic research field. He is a chap called Sir Macfarlane Burnet. He is arguably Australia’s greatest scientist and a noble laureate. He also was a fundamental scientist. His most extensive work was in the field of viruses and he actually embedded the techniques whereby annual influenza vaccine is manufactured and lots of other things in the virus field. He also turned his attention to the immune response to viruses and therefore to the field of immunology and became a very widely-known scientist. He was a completely different type of person to me because he was an introvert, he was aloof, he was quite stern, not particularly approachable but a wonderful lateral thinker. He himself went down this pathway of working on WHO committees although he was not all a natural committee person. Quite perverse. He wasn’t really – rather inarticulate, but he gave me the feeling that well if you best to spend a lot of time in research, you should really think about really the world and those with less advanced than yourself. As I say, he was a lateral thinker. He was not particularly a quick thinker interestingly enough. He was no good at answering questions at seminars, no good at explaining things in an open forum, but fantastic when you gave him a problem that he could take away and bring back the solution in a day or two’s time after he’s had the chance to think about it in his study and really come up with original, fantastic, extraordinary insights. That was Burnet and he gave me hope that my goodness, I can’t hold a candle to his ability in research. Because I study hard and work hard under him, I might be able to be a pale shadow of that very extraordinary person. I was lucky enough to make some interesting research findings and there’s a lot for my post-doctoral period, I was asked to go to Stanford University and although I initially went as a post doc, quite so my second mentor, my second boss there I might describe in a moment, said look it would look better on your curriculum vitae if we make you an assistant professor and here was I at the wonderfully ripe age of 28 years old as an assistant professor to medics and arguably the world’s second most prestigious university, Stanford University in their new medical school. Well, what was this boss who was the second hope giver, who was the second mentor? This was a chap called Josh Lederberg. If Burnet was slow, this chap had a lightning fast mind. He was penetratingly intelligent. He was an incredible polymath and in fact so extraordinarily worthy that he was the second youngest person ever to win a Nobel Prize in medicine. Second youngest person ever – he won at the age of 33. The youngest was James Dewey Watson of Watson and Crick team. He was only 32. So, Lederberg has this fantastic capacity to so incisively come to groups with a problem that almost before you have the sentence out of your mouth, he’d say “Yes, go on, go on. I’ve understood that. Now tell me, what’s the bottom line” and you know, it was a very, very interesting contrast to the other guy who was more of a dreamy, deep-thinking inner type of person. Lederberg was very external. The amazing thing about Lederberg is when he won his Nobel Prize, it’s had maybe not exactly a very good effect on his life. He somehow felt he shouldn’t do this genetic research anymore when the 10 years, he’s made so many discoveries that he won the Nobel Prize. He shifted to other things, some of which he wasn’t that good at. He shifted from Stanford University to New York where he became director of the Rockefeller University which is of course a people stardom better than director of the Rockefeller and as I say, he wasn’t quite as good with that. That while his mind was so active, he also broadened incredibly. Let me tell you the sort of thing he did. He founded the science of exobiology. Exobiology means the search for life outside the earth and the solar system and he devised all sorts of extraordinary instruments which went up on those Apollo missions and had, in there earlier, the idea of can we get organic molecules from space? Can we get some stuff from the moon that might have life on it and of course no such life was found. So, he founded that discipline. He was also very, very interested in war and peace and became, in a fairly secret way, an adviser to a succession of presidents on nuclear warfare and the nuclear threat simply because he could study up on a subject like that and come to grips with what the facts were so extraordinary and so quickly that president after president wanted to seek his advice. Anyhow, Lederberg was very good to me. He pretty much left me alone but was always there with an instant solution to any problem that I couldn’t possibly have myself. Well, you’ve put yourself in great company and I’m impressed with two things. One that those two gentlemen gave time to a younger colleague because so many people get busy and the second I’m impressed with is that you’re willing to give time to me. I’m not a scientist obviously, but you’re sharing your insight and I can’t tell you how much that means to the next generation. Well, that’s very kind of you and I think what you’re doing here is really interesting because this world needs hope, you know? We have a confronting series of problems before us and I mean you can take one of two positions. You can say oh God, the world’s going to hell in a hand basket and I want to get off or you can say, yes the world does have a problem or problems. If we attack them with good will and with hope, maybe we won’t be able to solve them all, but we will be able to make an impact here and there around the edges of these problems. Question 3: Have you had hopeless times in your life? If so, paint that picture. Talk about you for a minute. How have you used hope to get through? I’ll share a story here that not many people know. It was the most hopeless time of my life and it was entirely unexpected. But as a young doctor and starting my research career, I suddenly got a phone call from Adelaide which is a smaller city in SouthernAustralia. “Your brother’s very sick.” To cut a long story short, I hopped in a plane and I found my brother very sick indeed. I had to figure out a way of getting him on a hospital and putting him on the head of fatal illness. This brother was a kind of a hero of man. He wasn’t a medical, he was scientific, he was a biochemist. He had become a reader in biochemistry which is the equivalent of a professor at a very young age. He was destined to have a very stellar career. A disease struck him down and he died about a few months later. I must say, that’s in a way the darkest thing that ever happened to me because, you know, my parents died. My father actually wasn’t particularly old, he was only 68, but he reached a time of life when life expectancy was shorter and he had a terrible and difficult but essentially good life. My mom left at 82, both of course were big losses, but that was a period you ask, why? Why is it so? Why is a life cut so short that had so much promise. Did you get an answer for that question? Well, I guess the answer is hidden in the sky. It’s very difficult to figure out where something like that comes from and I’ve just been so incredibly lucky in my own life. I mean the question you asked, have I ever had discrimination, childhood trauma, et cetera, et cetera, addiction, bullying, illness, injury? Look, I’m a migrant. I left Austria at the age of seven with my parents who were fleeing from the holocaust period. But I have to tell you this, yes of course there were a bit of discrimination, of course there were a few people who would toss you in the streets and “get out of my way dear boy” or would say something like “you’re a bloody rifer” that’s what they call them. Refugees were bloody rifers. But, this was minor, absolutely minor in comparison with the love and friendship and openness and the welcoming that we got from the Australian people in those dark days of World War II. Absolutely minor in comparison with overwhelmingly good reception. In fact, I had a very happy childhood and I’ve never had anyone put a roadblock in my path or I didn’t have the feeling I had to grind towards success, sort of tramping on other people. I’ve been helped rather than hindered and that from point of view, very, very few periods of hopelessness. Wonderful. Well, it’s a great story and I’m glad you’re doing what you’re doing and it’s great to hear that the Australian people in those times were such kind people. I hear the same thing about them now and I think that’s just a wonderful example of how we can be to our community around us globally or locally. Well, what am I actually doing now to give others hope? I’ve mentioned to you the third world health work of Bill and Melinda Gates Foundation. Fairly enough, you’ll laugh at this Chris, about 7 minutes before you rang, the president of Philanthropy Australia rang us and I said, oh God, am I going to get to Chris in 7 minutes because Chris is going to ring at 11AM sharp. He gave me the good news that Philanthropy Australia, which is the peak body for philanthropy in this country, has appointed a new chief executive and he gave me all the outline of who this person was. Now, I’m enormously lucky to actually be the patron of Philanthropy Australia. In that context, I’ve become very involved with not only philanthropic giving which is important, but with a wide, wide variety of volunteering activities. As a matter of fact, you might be interested with some statistics here. The United States is the most generous nation in the world as far as actual financial contributions to philanthropy is concerned. Something like 2% of GDP. Australia is at about one half of that, but I think it makes up for it by countless, countless hours of people from, little people who are top professionals, giving their time voluntarily to charitable work, to wide, wide variety of volunteer activities that create hope. We don’t have to go through these, they can be very small things like the wheels on meals program for example where meals are brought to elderly people by volunteers and right upfront to major foundations and major activities. So, I’m very involved with that and more as again at the stage of more as a booster and advocate, sports person – I’ve given unbelievable number of talks on this and related subjects. Of course, the subjects which I love most which is the immunization programs and the health programs. Wonderful. That’s such a great example of not only the big things that we see on the front page of the newspaper with the big gifts or the big name like yours volunteering for something, but the little acts, the meals on wheels where the person you go see in that house may not have a clue who you are and what you do on a daily basis, but it means so much to talk to you as a person for five minutes. That’s awesome. Question 5: How can we take action by sharing hope? What would you tell me and the rest of the listeners? What do I do next? I think that the answer to this one is to be prepared to actually share whatever optimism you have developed about betterment of the society and the relief of social injustices and be prepared to talk about that “hide a lamp under a bushel”.I think it’s very important to give witness. If it’s a relationship to actual individuals, your family, your friends, be a bit demonstrative, you know? It doesn’t really hurt to tell a kid or a grandkid “oh gosh, sorry you failed that exam, but you know you can do better”, you know, encouragement. Positive, hopeful vibes in your daily life. You got to project that the lessons of life have taught you and mine’s a pretty long life. I’m just within a few weeks of my 84th birthday, but lessons in life taught you a more positive than negative. I understand people who gets downtrodden by the dictations of life and the difficulties of life, but by enunciating that, by living that, by valuably sharing that, they’re really not helping anyone. They’re simply not helping themselves whereas if you take action by sharing your hopefulness in your everyday life, by recognizing that you see the world positively starting with the people that you meet everyday, your friends, your children, your grandchildren and project this hopefulness, then your life is going to have a bit of an impact and it will not be wasted. You’re so right. It is the people who smile at me from the next car over in traffic or through the store window that make me remember at the end of the day, that was a nice person, that was really warm, it was encouraging and just a simple smile but they’re going out of their way to shed some light on another human and I appreciate that. That’s a great action point. I think that’s absolutely right. I can tell you a fundamental story. When I was a school boy growing up in Sydney, as it happened we moved to Melbourne in my mid to late 20s. My mother was sort of very outgoing and valuable and we’d be sitting in the train going into the city, into Sydney and she’d smile at the person, total stranger, sitting next to her on the train. I would be immensely embarrassed and she would say, “sitting next to me is my son Gusti, you know, he is very clever, he came back to the school last year, blah, blah…” and she was just like that with everybody. The number of people when she died after a long life that came to me and said she has been such a positive influence in my life. What a great example. What a great legacy. Well, how can people connect to you? If we want to find out more of what you’re doing or follow you along in your travels, how do we do that? I’m a terrible person on social media. I haven’t got a blog, I haven’t got my hands in, but in point of fact, I will be easily contactable by Wikipedia, easily contactable by the Gates Foundation or by the World Health Organization and I’m just trying to keep on doing roughly what I’m doing because at 84, I’m also spending a little bit more time at home now with the family and sharing hope with them. That’s perfect. We’ll put your links from the World Health Organization, The Gates Foundation and your Wikipedia connections there on the show notes page at isharehope.com and you’ll be able to find so much more information about Sir Gus there. We ask each person this sir, what is your favorite thing to listen to when you need to just lift your spirits, get pumped up, what kind of music do you like? I told you I was Austrian and I said to myself when Chris would ask me that, it’s going to have to be Austrian so I’m going to say to you Franz Schubert’s wonderful songs called Winter Journey. It’s long – it’s for singing by a solo tenor and it is just that. It is life’s journey. It is deeply, deeply moving and while it has aspects in it of being quite sad, it’s also immensely hopeful. So, have a listen to Frank Schubert’s Winter Journey. I will. I’ll do it and also put a link to where to find that music on our show notes page as well so we can share that too. Thank you sir. Wonderful. Love it. Love the music and love the steps. Such easy to follow. Just encourage people with what you have to encourage them with and sir you have just been fantastic. Sir Gus Nossal, world renowned immunologist and head of so many things for the Gates Foundation, World Health Organization and so much more. Your life has been impacted by this guy even if you don’t know who he is, but now you do. Sir, thank you for your time. I really appreciate the effort and the energy you’ve spent for your whole life doing so much around the globe. Thank you very much for this excellent program and very good luck as you go towards its completion. Bye and thank you so much. All the very best. Well, not interview, but just had to call you back again. You’re truly an incredible individual. Thank you. That’s very, very kind of you Chris. I’ve enjoyed that very much indeed and I hope it comes together well. I’m sure it will. I really appreciate your time and I mean that sincerely. The time you spent in your profession, I know, has impacted my life and the life of my children. I know there are benefits in life, from a health standpoint, and probably a world economy standpoint that we’re realizing that are hard to measure but are there. I hope you realize that you’ve impacted way more than white blood cells. You’ve very, very kind to say so and we just keep on trying. All the best. I’m with you. Have a good one sir. Bye.